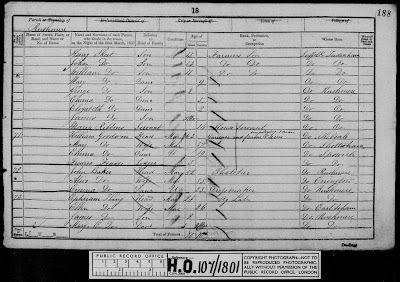 The 1871 Census was taken on Sunday 2 April 1871. This was the first census which recorded whether a person had a disability (imbecile, idiot or lunatic - not exactly politically correct by today's standards!). For Mark, this census proved to be particularly important. His great grandfather Ephraim was aged 11 and was living with his mother, Ellen and his siblings at The Fields, Rushmere St Andrew. His father appears to have died as his mother's marital status is widow. Ellen is supporting her 8 children although it appears that they may be supporting her, the eldest son living with her, James, is working as an Export Clothier's Porter, the eldest daughter, Eliza, is a Domestic Servant, although currently unemployed, Walter aged 18 is a Export Clothier's Warehouseman and Thomas, aged 14, and Ephraim aged 11 are Agricultural Labourers the remaining 3 aged 9, 7 and 4, are at school. 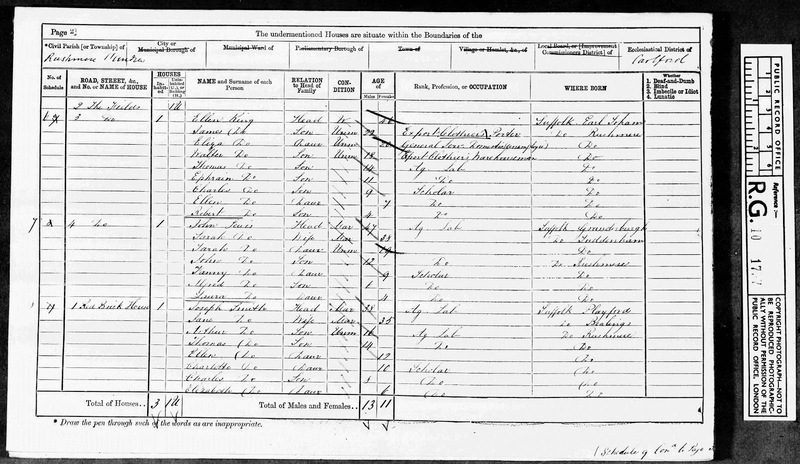 So, this census gives us Ephraim's mother's name and a year and place of birth, and the names of some, if not all, of his siblings - all this information can now be added to the family tree. 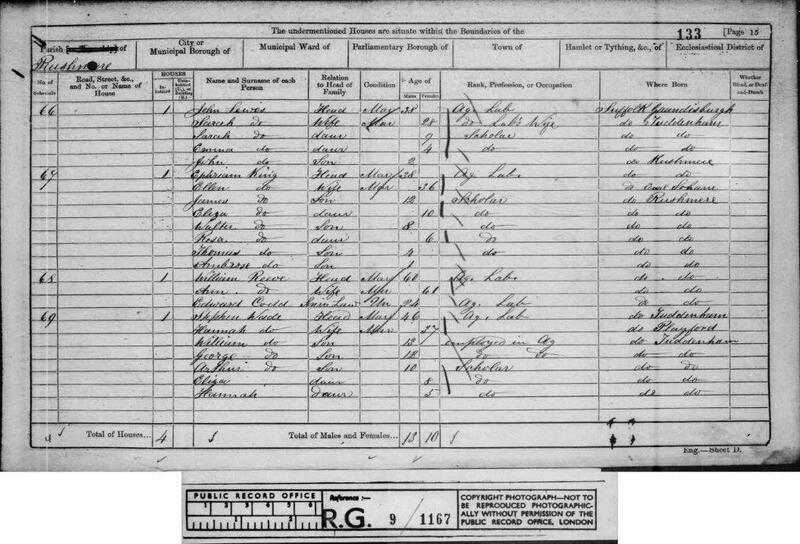 The 1861 Census was taken on Sunday 7 April 1861. The information collected was the same as that collected in the 1851 Census. 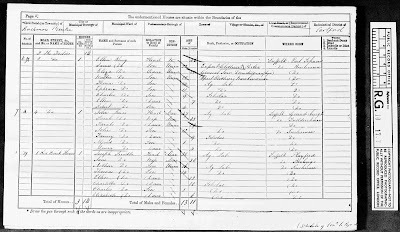 Up until now, everything has been quite easy, however, after searching for Ephraim in the 1861 Census the four results which came up did not fit with the information we already had. The mother's and the sibling's names were all different, and the place was also incorrect. We then repeated the search using his mother, Ellen's information; putting her details in the search engine instead of Ephraim. Fantastic! We had found our family! They were living at Head From Home (very unusual!) in Rushmere, the same village as in the 1871 census, and all the details seemed correct - names and ages. Ellen was married to Ephraim and the one year old son who we thought would be called Ephraim was actually called Ambrose! We now had the name of Ephraim's father, also Ephraim, his place and date of birth and another child. Ephraim's (senior) occupation was an Agricultural Labourer, and all the children were at school. More information to add to the family tree. 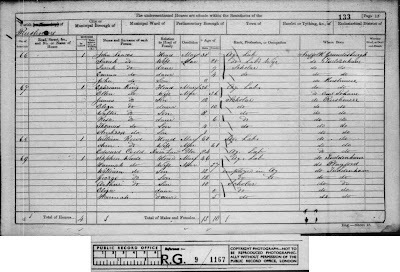 The 1851 Census was taken on Sunday 31 March 1851. There was far more information contained in this census compared to the previous census for 1841: relationship to head of household, marital status, place of birth, whether (blind, deaf or dumb) and this time the ages were not rounded up to the nearest 5 years. Mark could no longer look for Ephraim, his great grandfather, since, in 1851 he had not been born. The search now diverted to his father, Ephraim, born in 1823. This information was input into the search engine of the website where he was searching for the census records. Ephraim was found with Ellen at Rushmere House, Rushmere with their two children James aged 2 and Mary aged 2 months. The 1841 census, taken on Sunday 6 June 1841, gives the least information of all the census returns. Ages are rounded up to the nearest 5 years, except for children under 15. The occupation was included and whether they were born in the same county as they were this year, elsewhere in the country or in foreign parts. Mark now had to search for his great grandfather Ephraim in Suffolk who was born around 1826. Mark had previously used + and - 2 years but on this occasion that brought nothing up. He widened his search to 5 years + or - and a likely family was found. Mark was lucky as Ephraim was not a common name, he was also lucky that Ephraim had not moved from the place he was born. 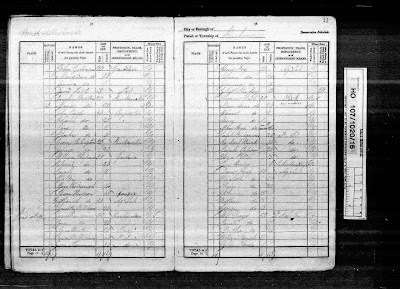 Remember that the ages in the 1841 census are rounded up to the nearest 5 years for people under 15 and you can see here that Ephrain and his brother Nathan were both marked as being born in 1826. To double check this, if you are unsure whether this would be your relative, you could look up the parents and siblings and make sure there is not another Ephraim living in the village or with his parents and siblings. 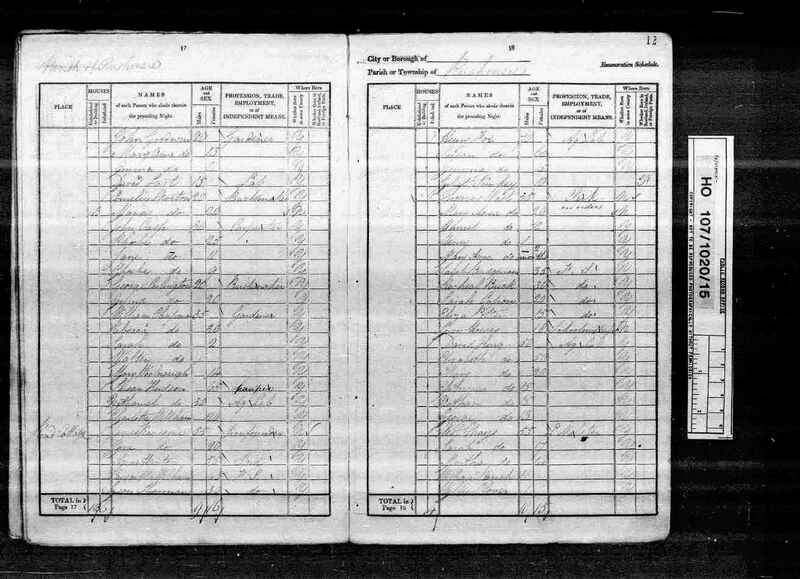 Mark found his great great grandfather and great great grandmother thereby taking his family back to around 1791 by using this census and was able to add this information to his family tree. Mark decided that he would like to carry on with census data for all lines of his family to see how far he can get back. After he has done this, we'll come back to filling in information on the relatives we have already found. Mark has already found that he needs to combine census records with birth and marriage indexes in order to confirm surnames and dates of birth. This would be a sensible way to continue, rather then relying on just census records. 6. The 1841 census rounds up ages, so be sure to remember this when searching for your relatives. 7. Each form given to a householder when completed was then given to an enumerator who transcribed the details into government lists, these lists are the records we see as census returns. Therefore, if the original details were written carelessly this information could have been written incorrectly on the census returns. The enumerator could also have made mistakes. 8. You can check on a family's movements by looking at the birthplaces of children and the dates they were born. 9. When using website's transcriptions, be sure to look at the originals in case mistakes were made when transcribing - this is quite common.